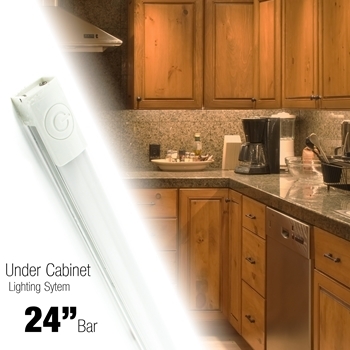 LED under cabinet lighting touch-control system 24". Slim design easily hides from site. Integrated Touch On/Off switch. Can also be controlled with switchable wall outlet. No LED spots or glares. CLS lights have near-zero LED spacing and produce a smooth diffused light. Incorporates a diffused polycarbonate lens.